I think one of my favourite things about reading blogs is getting to hear so many different opinions. I believe you really get to know people by finding out their view of the world. I love reading all kinds of blogs, but some of my favourite posts (apart from the ones featuring beautiful interiors) are the opinion pieces on current affairs. I love when bloggers take a news story and give their opinion on it, sharing their life experiences and expertise as they write down their thoughts. 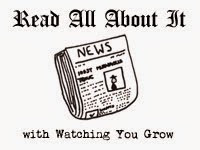 With that in mind, I thought I’d try setting up a Read All About It linky so that all of these current affairs posts could be collected in one place. I’d love to read all of your news posts, and I’m sure other people would too. Your posts can be about local news, national news, political news or whatever kind of news interests you. I’m sure there will be a number of political themed posts with us now being in the run up to the general election, but you don’t need to limit yourselves to political news. It could be a ranty response to a newspaper column, or a post welcoming some changes in your local area. I’ll be posting a new Read All About It linky post every Monday, and it will run until the Sunday, so you can join in at any time during the week. To join in, all you need to do is include the linky badge (at the end of this post) on your post, and then submit your post to the linky (hosted here). You can link up your favourite news post from the previous week, or write a new one especially to join in, it’s up to you. I would love for you to join in. I’m hoping this linky will keep me up to date with current affairs, as well as introducing me to lots of new blogs to read! I’ll be commenting on and sharing posts, and encouraging others to do the same. I’m hoping we can build a little community of bloggers interested in currents affairs and what’s going on in the world. Will you be joining in with the first Read All About It linky post on Monday?